Well-connected landscapes are necessary to sustain many of the natural and cultural resources important to the Appalachian region today and into the future. If these large connected areas are to endure and be resilient to impending environmental changes, it will require a collaborative effort involving many organizations and reaching across jurisdictional and political boundaries. 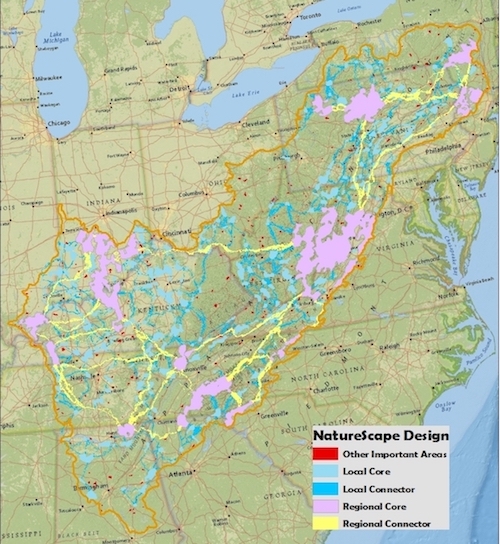 The outcome of the Appalachian LCC Conservation Planning process and modeling is a dynamic ‘Conservation Blueprint’ or 'Landscape Conservation Design' called NatureScape. This is a dynamic or living design envisioned as an ongoing consultation with the conservation community - continuously incorporating new information and datasets as well as engaging subject-matter experts and committed stakeholders. Phase I and II of this effort are described below. In Phase I of the Appalachian NatureScape Design, a research team out of Clemson University used super-computing technology and Marxan software (the most widely used conservation planning tool in designing networks of terrestrial, aquatic, and marine conservation areas) to identify ecologically significant habitats and natural resources that are connected across the landscape and will be resilient to future threats. Researchers identified five conservation elements covering critical ecological processes and patterns across the Appalachian LCC geography. These elements include large interconnected regions (cores) as well as broad landscapes that connect them (connectors). Other smaller areas that are likely to contain key natural resources than their size would suggest were also mapped. In Phase II, Clemson researchers and Appalachian LCC staff coordinated a series of consultations with experts across the region to incorporate priority aquatic species, habitats, and ecosystems into the next iteration of NatureScape.These experts helped the LCC identify appropriate frameworks for assessing aquatic integrity, key conservation targets and threats to aquatic ecosystems, and delve further into representative databases of the region. The data assembled and modeled for aquatic resources were then combined with results from Phase I to produce a series of maps and data layers integrating aquatic connectivity with terrestrial significant habitats throughout the Appalachians to guide conservation planning and decision making. Since cultural resources are an additional critical piece of conservation design in the Appalachians, a conceptual framework is being developed for mapping cultural resources across the entire geography and will be integrated in a future iteration of the conservation design. Video Overview of Appalachian LCC NatureScape Design: Paul Leonard of Clemson University provides an overview of the Appalachian LCC NatureScape research. The first part of the presentation focuses on phase one of the project, which identified key conservation elements in the region that are essential for sustaining biodiversity and the benefits of nature. He then summaries the next steps in the research, where Clemson researchers and technical teams will refine the initial phase by selecting metrics of aquatic integrity o fit into the conservation design framework, determine resolution for region-wide aquatic integrity index, and discuss major threats to aquatic systems and determine best scale to examine integrity.